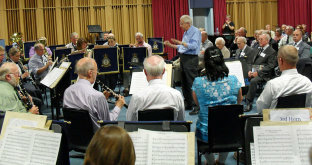 The RAF Music Services Association exists to foster goodwill amongst everyone who enjoys military music and to keep alive the comradeship of the Royal Air Force Music Services. Membership is open principally to serving and ex-members of the RAF Music Services, including the WRAF Band, and RAF Voluntary Bands, but anyone who has an interest in music in the RAF past and present may join as an Associate Member. Members receive The Blue and the Gold magazine, which is published twice a year and is full of accounts concerning the bands today, as well as articles from ex serving members about their memories of times past. The Association also organises an annual reunion every year, usually in July. On this website you can read more about the history of the association, keep up to date with the latest news, learn about our annual reunions, and find out how you can join. Members can also log in and access additional information such as a directory of members.